Bestwestern Premier The Hive with Back to Kampong promotion proves that a humble plate of Nasi Goreng can be a charming way to start the year. Beginning of the year in a hotel is usually cherished with many interesting promo as many people agree that a good year should be started with a strong impression. That is why January is a month with many fresh, innovative, and surely yummy treats in the monthly menu. 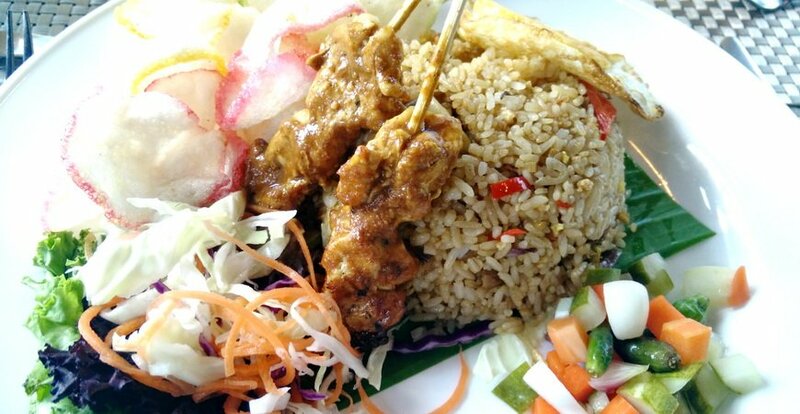 However, who can say no to a humble yet satisfying plate of Nasi Goreng? Less is more. Heather Resto of BestWestern Premier The Hive seems to hold on to the saying. Starting 2016 with “Back To Kampong” Promo, BestWestern Premier The Hive serves six types of Nasi Goreng which include Nasi Goreng Tom Yam, Nasi Goreng Ayam, Nasi Goreng Teri Medan, Nasi Goreng Jawa, Nasi Goreng Kambing, and Nasi Goreng Bebek for Rp45,000,- nett. This promotion is available from early January to the end of February 2016. “We decide to choose Nasi Goreng as the year beginning promo as we want our restaurant’s promo to be elevated month by month. We would like to start this year with humble, simple thing,” said Chef Dany Darmawan, Executive Chef of Heather Resto at BestWestern Premier The Hive. One of the highlighted point is we can see that not all of the Nasi Goreng plates are authentic Indonesian menu. Of one them is Nasi Goreng Tom Yam. “The emphasis is actually on ‘kampong’ or village. It is not only Indonesia’s kampong, but also other country’s. As we know, Tom Yam is one of the most humble yet loved dish in Thailand as Nasi Goreng is in Indonesia and I thought, why don’t we just give it a try?” said Chef Dany. All Nasi Goreng are served with fried egg, two satay ayam, lettuce salad, pickles, and to complete the kampong theme, colourful crackers. “Nasi Goreng is a dish that is very familiar and feels like home for Indonesians. This menu is also easily customized depends on customers’ preferences. Most Indonesians fall in love with hot flavour, indeed. Yet, hotel’s guest is not all Indonesians. Asking our customers about how they want their Nasi Goreng becomes one of our most important procedures. Mostly, our guests customize the spiciness level,” said Chef Dany Darmawan. Besides yearly ceremonial menu such as Valentine, Christmast, Chinese New Year, or Eid al Fitr promo, Chef Danny said that Bestwestern will promote mostly Indonesian food on their monthly promo. “We have oxtail menu in next promo. We will also celebrate street food festival. Last year we have Sulawesi promo, serving Makassar street food,” said Danny. In a hotel with many types of guests, Dany said he cannot always stick to authentic recipes. Indonesian food is spicy and delicious. However, not everyone can stand it. “Like I said before, we cannot force our guest to enjoy spiciness if they are not familiar with it. The second thing they also often change is the aroma. Some ask to reduce shallots and shrimp paste in my dish. Some even ask to make them more authentic in the meaning of making the dish super spicy. It depends on customer’s preference and we cannot object that. We live in hospitality world where we have to sure that our guests are always happy,” said Danny. Picky customers do not change Dany’s mission to serve good Indonesian food in Heather Resto. Indonesian food maybe a little bit late to have its popularity in the world although they deserve it, he said that as well. To achieve that goal, Danny tried to make his dishes as tasty as possible for everyone’s palate but still tastes good. Danny hopes that he can introduce Indonesian food to Heather Resto’s guests and hope that they will love the food. “For me, the key is to serve food that no one can resist. The example is Nasi Goreng. The ingredients must be easy to obtain and the supply must be very high. Monthly menu is expected to have high demand so that it cannot be ran out and must available in high quantity,” said Danny. To give more satisfaction to customers, Danny tries to make every dish in his promo has versatile and easy to find ingredients. Moreover, the ingredients should be usual ingredients that are available for permanent menu. “When your monthly menu is that good, sometimes customers miss it and wanting it again and again. You must think about the possibilities that your customers will want your monthly dish when the promotion is over. My advice is not to turn them down. If you think you can still make it and the ingredients are available, go make the dish for your customers,” said Dany. This can be a kind of your market test. If customers love them, do not let the chance gone by not including them in your permanent menu. “Before I make promotional menu, I will test them to all decision makers in the hotel like General Managers, Public Relations Staffs, and Marketing Communications who will apparently promote our menu to our guests. However, I think it is better if my real customers get to experience this market tests as they are our target,” stated Danny.